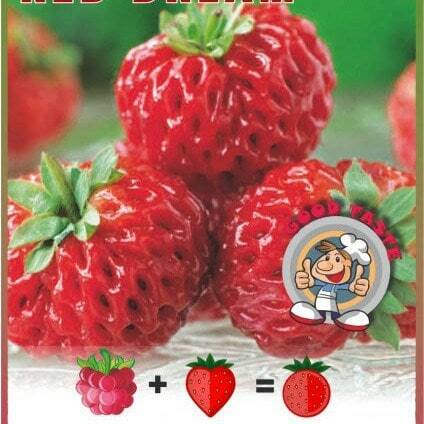 Buy framberry 'Red Dream' framberry Red Dream: A new taste sensation! A breakthrough in breeding has created this amazing new fruit. It looks like a strawberry, but it tastes like a cross between a strawberry and a raspberry.....your taste buds wont believe it! Garden care: Prepare the ground well before planting. Clear all the weeds and dig in lots of well-rotted manure. When planting out, space the plants at 45cm intervals with 75cm between each row and apply a generous layer of mulch around the base of the plants, being careful to avoid the crown. If training onto a support, tie them in as they start to grow and keep the runners off the ground. If you want to grow them in the more conventional way and let them trail along the ground, then put a thick layer of straw or use strawberry mats under the plants to stop the fruit touching the soil when they are starting to form. Sheets of black plastic mulch can also be used, and it will also help retain soil moisture, reduce weeds and encourage early cropping. These plants are self fertile, however you often get a bigger crop if they are planted near strawberries. Plant was dispatched after 2 weeks like I was advised. It arrived within a few days of being dispatched. The plant itself looks healthy, nice bright strong green leaves, a good size and strong roots. It was packaged extremely carefully meaning it arrived in perfect condition and the soil was damp so it didn't suffer in the hot weather! It's all repotted now so fingers crossed for lots of yummy berries! I can't wait to find out if they actually have a hint of raspberry to them!